Rabbit Stew: Hunting Psychology: What am I aiming for? I had no idea what was going on, so I went home. I'd woken up early - gloomy - and gone out to the fields rather than sit around at home unable to sleep; as soon as I got home again, I fell asleep. I went fishing and - after a while - was delighted to get a good strong bite. 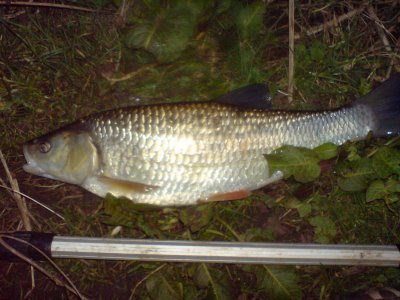 After a brief struggle I pulled the fish into the landing net - but it wasn't a Pike or a Perch, it was a large Chub. As I was unhooking it a man and his young son walked by and I showed them the fish and invited the boy to touch the beautiful iridescent back of the Chub before I put it back in the water. Delighted and frightened, the boy slowly reached out and touched the fish with one tentative, outstretched finger. I put the Chub back in the water; it floated there stunned for a few seconds and then slowly swayed itself back into the heavy-rain-fed brown flow of the river - and disappeared. I've seen a recipe for Carp Stew (here) which says you can substitute Chub for Carp but I'm not convinced, I think it would be pretty grim - so that's why I put Chub back: I don't want to eat Chub. Walking back down the river without a fish to eat, I thought about hunting rabbits and realised what was going on. I wasn't aiming at rabbits this morning, I saw, I was aiming at myself: I had set out to hunt a rabbit in the hope - not that that I could get a rabbit - but that I could get myself an identification - a picture of myself - as someone who successfully hunts rabbits. I was miserable and I wanted to understand myself as someone who can - at least - do something right: hunt rabbits. So I wasn't, strictly, trying to get a rabbit at all - because, as an aim, this is a very different thing - I was trying to find and secure a picture of myself that I could understand myself with and also offer to other people as a representation of who I might be. That's why I was so cross and upset - I wasn't miserable about the absence of a good meal - I was miserable about the absence of a good me . So, in order to shoot rabbits, it seems, you have to really be aiming at them, and not at something else. Be good to yourself dude, you might not have a bunny YET, but you have a kickass blog!